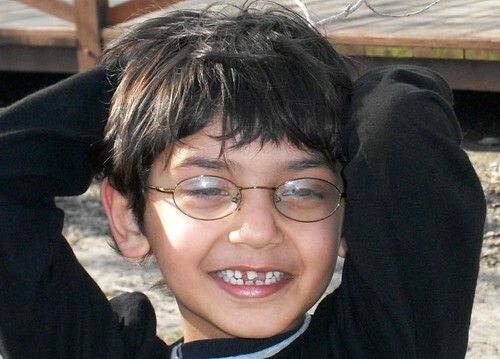 When 8 year old Ayman decided 2 weeks ago to go into business for himself, he never imagined that his biggest dilemma would not be as to which lemonade recipe to use, or how to secure customers or even which charity to support. The biggest crossroad this 8 year old faced revolved around the agonizing decision of whether to be a sole entrepreneur or to go into partnership with his buddy. As I watched my little entrepreneur struggle with this decision, I was amazed at how methodically he approached this problem. Pouring over the lemonade stand book, which came with ideas on how to go into business, he decided to list the pros and cons of both situations. On one hand he felt that being a sole entrepreneur will limit the amount of customers he can serve at a time while on the other hand he was nervous about his buddy having his own take on how to go about the business. Support of his friend in undertaking this task was very important to him while his friend’s customer service skills were a big concern. The idea of sharing his profits vs. paying someone to work for him was also a big deal. As a mother and a fellow entrepreneur it was amazing and exhilarating to see him traverse this journey with something as simple as a lemonade stand! Ayman may not realize this as of yet, but this decision is the first crossroad many “older” entrepreneurs face themselves with as well. The initial reaction of someone deciding to go into business for themselves is to surround themselves with family and friends without regard to their depth of knowledge for the business or their contribution as it pertains to the business at hand. At times this is the biggest mistake an entrepreneur can make as down the road inexperience and family/friend issues can get in the way and create problems. Ayman has since decided to be the master of his own fate and go into business as a sole entrepreneur calling his company “Mix Max Lemonade”. Having secured his first investor, he is busy working on what sets his company and product apart and which charity to support with parts of his lemonade sales. After much consideration, he has decided to work with Pennies for Peace, a wonderful organization which provides school supplies for children in underprivileged countries. Having found out that he can pay for a child’s 1st grade tuition with just $20.00 a year, Ayman’s goal is to generate enough income to pay for 2 children this year alone. In order to achieve this goal, Ayman is designing and selling small packs of knick-knacks of which 100% of all proceeds will be donated to Pennies for Peace. Without realizing he has hit on another valuable lesson of entrepreneurship – cross selling products to generate additional sales per location. 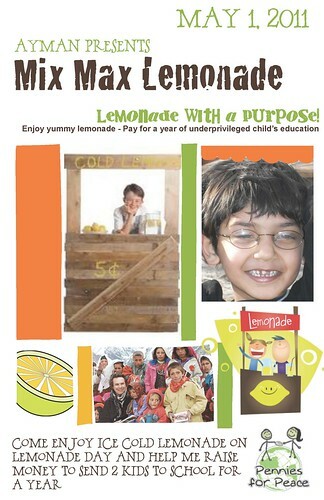 To register your child for Lemonade Day visit lemonadeday.org and find your city!